Please post any bugs you find in here. There is a new bug report form. Please fill this form out to submit any issues directly to me. What version of the game you are running. Great improvements! now just one more thing and a possible suggestion. when the ai walks they stop walking to reset to their original standing position and then continue walking. its only for a single frame (and it does not bug me) but idk how others would feel about it. plus if you could make it a goal in the game to run the shop and make the player have to pay bills that would be a really interesting touch. I'll be continuing to perfect the AI and I'll do my best to address that issue. It bugs me a bit so i will for sure try to get that ironed out. Sorry if this has already been answered but how do you fix the bug where the hammer ownt hit the bars? The game keeps crashing i want to play and it says that it crashed i have not got to play but i have been trying for hours please help i want to play very bad!!!!! Hey guys, go to your graphic settings. Turn up the gamma or press the reset button. reseting does the job, but turning gamma up did not really help. it helps me seeing things but some certain objects like walls etc. still look dark and moody. i'll look into adding a brightness slider. Hopefully that will help. But i cant click in gamma im in fullscreen and the mouse is deregulate to the screen what can i do? Did you make sure that you had an option selected in the radial selection wheel? I have this same problem but I cannot seem to find what you are speaking of. I downloaded the game through the itch.io application instead of just through the website. Could you help me? in my version 0.0.72 there is a bug were , in sandbox mod , when i destroy a bolder, some of the parts float in the air and go white. If the taxes and bill thing is added make it an optional difficulty thing please. for some reason i'm stuck on the menu is there a specific button i need to press or does the game start on its own. Should start right away. No need to do anything. The new version lagging very much!! i have a bug i downloaded the game and when i open it it says The UE4-ShopSim Game has crashed and will close and it says Fatal Error! and delete the folder. Run the game and let me know if that helps? i delete the ShopSim folder? If you are using windows 10, locate your Taskbar and the search bar, type DXDIAG in the search bar. This will run the DirectX Diagnostic Tool. Take a screenshot using the PrintScrn button, paste it in Paint or any photo editing software. Then upload the image on here as a response by clicking on the "Add Image" button when replying. I'll try my best to help you with your issue. Usually people will say it like "Win+R" keys. Hitting them at the same time (or holding one and then hitting the other) will bring up Window's run cmd-line - Typing dxdiag from there will give you the basic run down of your computer specs. There's 2 pages (generally) of basic specs, the first page is nearly all basic except gfx chip/card - the second will tell you that one, along with some connective devices, sometimes. The other pages aren't generally useful in situations like this. If win+R doesn't work for you, like Dasius was mentioning, you can simply open the start button, and then in the search bar, type dxdiag and hit enter, you don't have to way for it to actually search for dxdiag or find it in the list. - This feature should work on Most Vista+ versions of Windows... I think.. maybe one of the versions of xp had it... but maybe not.. I dunno. My memory isn't "great"
I have been playing for a few days now and have reached tin, but there's one problem, the customers don't appreciate the tin and order copper. I've already tried just making a tin weapon for the but they didn't take it they just stood there. Any Ideas on how to fix this? Hello, I'd like to report a bug on when you try to upgrade your stats, I don't know if this has been mentioned, but every time I go to my stats, my character starts looking up which blocks me from being able to upgrade my stats I'm playing the alpha version 0.082 I think that's it, but I love your game and this is just a tiny problem I'm having. You do realise this post is a year old now, right? Go to the last page in this community post to find the latest ones, you're in the first page currently. i ran into a bug while playing i tried to sell a weapon to a customer and the game started to spawn in an infinite amount of hero gards then game started to lag. btw love your game keep up the great work. Had that bug as well. Version 0.1.0 . If a customer asks for a specific gard, it starts raining that gard inside the house, filling the floor.. The game goes laggy as well.. Btw, is it not a bug that u can fly when u try to grab a shield that your standing on? It happened (for this patch) because You had a Specific Sword customer, they specified what grip, guard, and blade they wanted, and you didn't provide that. Don't mess up a Specific Sword Sale, or, don't be holding an incorrect item while the specific sword customer is still there. Just Dismiss them to begin with and don't serve them. Tyvm for that! I didn't know multiple customers come cause of the shields. I ll keep giving them shields though.. It's getting harder but more interesting and more profitable pre hour! Not sure if this is the issue has you haven't given much detail but check to see if you meet the system requierements to run the game. Okay umm... well i was moving my anvil around and accidentally put it exactly where I am standing. Anyone got a fix for it? PLS? What is your computer spec? Dasius,PLEASE HELP ME,i want to install My Little Blacksmith Shop,i have done all that it needs,when i open it says i need Mincrosoft Visual C++ RunTime,i installed it,AND IT KEEP SAYING I NEED IT,WHY? Since something similar to this is happening and i cant submit a bug report provided above, I'll tell ya my prob here. I downloaded the windows 64 version and after following instructions I wasn't able to open the game. It gave me this code that goes like this: [Place Saved], [Name of download], then ..\..\..\shopsim\shopsim.uproject, and then Createprocess() Returned 5... I would send a screen shot but... didn't go so well. Think you could help me? But i cant click on reset the cursor its disregular they cant click what can i do please help!!!!!!!!!!!!!!! The crystal bugs through the walls, but this is actually quite funny. The items are not included by the customers. There should be a direct sales point. With the oven you have also low performance settings, but this is not bad. My Computerpecs: i5-4460, GTX 1060 - 6GB VRAM, 16GB DDR5 RAM This should actually work well. The house is placeholder until i make a better one where objects won't be able to bug through it but thank you for mentioning it. It's on my to-fix-list for sure. What do you mean by the over has low performance settings? Is it causing perofrmance issues? Are you getting low frames when you use it or look at it? Your specs should run the game butter smooth i believe. Let me know if you have any performance issues. Will help alot. Yes, as soon as I look at the smithy, I have fps drops from 100fps down to 20fps and that even on low settings. Something consumed too many resources. I keep you posted when something like this happens in further updates. Thank you for letting me know Storiie. I'll look into it and get it fixed on the next update. not sure if you know this but I say what errors I found. Sometimes the money is not taken for purchased items so I can order infinite free supplies. When putting pre-made items on the inventory they do not pick them up, I have to take them off and put them back on. It does not happen often, but sometimes the ingots do not heat up when on the fire, I have to remove them and start over. Apart from that pretty good game, I already posted my gameplay but that video doesn't show the bugs it was a pretty smooth recording, again I look forward to any future version released. Thanx for reporting the bugs. I'm looking into them. I should have an update with some of the fixes to these issues sometime this week. The first is when I start using the inventory wall, NPCs will enter the shop and immediately leave. Tried it on multiple games and once it starts happening it does not stop even after closing the game. The second is that the crafting table frequently gets larger items stuck inside it. When crafting a greatsword in particular. The blade often tips into the table itself and gets lodged there. The polearm does this as well. Occasionally restarting the game will disassemble them and unstick it, but this rarely works. Another is sometimes the forge will stop heating metal entirely. A couple of ingots will start to heat but not reach full heat. After this happens no ingots will heat. This persists through restart. Almost from the start the coins start getting stuck in the chest lid or fall out entirely. Sometimes because of this when you order new supplies the counter will not go down, allowing you to order an infinite amount of supplies. This continues until the player moves at least one coin from the floor to the chest. At lower resolutions the lighting is so poor in the bedroom area you cant see the bed and have to hop you find it. It also causes difficulty getting items out of the receiving area at later hours even if customers are still arriving. Thanx Vanris, the next update has some fixes to your report. With concerns to items getting stuck in the table, you can rotate the weapons out of the table. This is more of a physics issue but i'll continue to find a way to mitigate further problems. I love the game, I look forward to the update. Disassembly on anvil is difficult, unsure of how this is written but detection for disassembly is spotty at best. Two-hand Grip + Two-hand Guard could not be disassembled on anvil. Large blade (3 ingot) could not be added to two-hand Grip + Two-hand Guard. Unsure of requirements to build "Greatsword", as Two-hand Grip + Large blade does not meet requirements. Would be nice to have a guide to terminology to make it easier to determine part requirements on customer request. And Polearm grips have a nasty habit of clipping through the house walls upon delivery and getting stuck there. A customer had just accepted the greatsword I made them and said thank you and I got paid. But then the customer began to run in circles on the spot and continuously turn to me and say thank you over and over. It amused me greatly. Edit 2: He stopped the circles when I closed the shop and opened it again. The AI is bugging out the game was working just fine i had almost no probloms... after a little bit the coins didnt go down when i bought stuff i fixed that by reloading the game. A few in game days later the AI walks in the door then turns around and walks out every single time non stop sleeping didnt work or reloading the game. I don't like to be rude, but, this game is ridiculously buggy and I cannot play it at all, period. In my first attempt of playing the game, everything had ice physics and I couldn't place anything down on the anvil without it buggering off to the moon. In my second attempt, customers didn't say anything , making it impossible to fulfill their requests. And in my third and final attempt, The hammer didn't work at all. I heated two iron ingots fully, placed them on the anvil and tried to hammer them into a blade and... well... nothing. I tried rapidly clicking, nothing, I tried holding it down, nothing, I tried clicking periodically, nothing. Additionally, the game lacked any audio whatsoever. i had no issues, did you try reinstalling the game? or possibly using the itch.io app to install? Could you give some details on your computer spec? Did you play the 32 bit or 64 bit version of the game? same problem! I was using the latest version and even tried starting a new game, same thing there. x64 windows | computer specs are fine.. It's definitely the game not my hardware if the hammer doesn't appear in the weapon smithing cycle. I'm pretty sure this has been reported but just wanted to put my 2 cents in! Is this the lastest version(0.0.6) of the game or version 0.0.5? not sure which version i was using, i just downloaded that day and played so, i guess .06? but then comes the tiredness then they leave seconds after, and all the hard work and money goes away for a 5 second costumer, you turn your back for a sec and they are gone. money= cmon, give a little bit more money for begginers, there aren't explanations on how to make things anyway. how to= just a small paper that says that a small blade with one handed guard and one handed handle = dagger for the start of the game because it can be cunfusing sometimes for beginners and then restart just to get the 7 dollars back to fix what you have mistaken, it was kind of frustrating, sorry but the examples on the wall doesn't help really much. as i mentioned earlier, if it is possible to fit the right things in then to just try to place it down and try to rotate it, maybe there is rotation option and i didn't know, because its frustrating that you make something and you believe it the right thing you need to make but isn't so all the work and money went into nothing. being able to deconstruct= i dont know if that is realistic to be able to reconstruct items from what has been made already but if its a possibility then why not. clipping= there is an issue with one handed guard and two handed guard being clipped together, very annoying. hope you see this and make your specific approach to every single one of these. - of course glitchy hitboxes, stuff going through every surface. - 300 dollars are pretty noisy. I'd suggest muting coins inside the chest. - probably unrelated, but at the same time my supplier started giving me 100% discount, all my customers started walking into the shop, turning around and leaving. I'm not sure if it's a bug or me just missing something, but I can't get the shop to open. I've clicked on the sign and added a name, but the inside of the door still tells me I'm closed. I'm on Windows 10. Oh I needed to put something on the sign and then click on the inside of the door where it says closed. I just got the game today and when I was working on a one hand sword for a customer, after I put on the hand guard it wouldn't allow me to put on the handle. I was dropping them on top of each other and the customer eventually left which then ruins my business for the rest of the day. After I pause (usually to change to graphics) and then unpause, the game window is enlarged almost like it is fullscreen. The only problem, however, is that the bar at the bottom of my computer is still there and my mouse can scroll over (which causes problems when I look down the grab items). I also could not put any points into any stats when I started playing, though my card did say I had a point in each stat (after leveling up only once and not using any points). When I restarted, I could invest the points. I do not know if the fullscreen glitch I mentioned above has anything to do with this (I was in fullscreen until I restarted). 1. The people get stuck on the door not allowing me to close it or they run circles in the doorway . 2. The people after a several days come in the door say what they want then immediately leave. 3. When opening a delivery indoors items will glitch through the ceiling and/or fly outside. 4. After detaching a sword from its grip, the grip then cannot be reattached or attached to another sword. 5. When adding a fancy grip, I don't think the price increased. 7. Suggestion: It would be nice if it were easier to get to the hammer varieties without having to go through all the sword varieties. 8. I thoroughly enjoy the game ^_^ and cannot wait to see what is in store for the crystals and what other weapons are to come. Pole Arm does not seem to assemble. It might be a collision box issue, ill make some adjustments and roll it out in a my patch. If not it will be addressed in the next update. I've played the game for an hour or so now. Every time I level up I put the points into charisma. However, I've been looking at the prices I've sold things for and it keeps going down. With only one point in charisma I was selling war hammers for $50, but great swords for $28?! And I'm now only about level four, and war hammers prices have dropped to $18, and so on. But at this point it doesn't matter, because the glitch where the costumer comes in and then leaves right away started, so i cant sell anything anyway. I love this game and idea, but I'd love to be able to KEEP selling things, and selling them at reasonable prices so I don't go bankrupt. Keep up the good work, and I hope these issues are fixed soon! I'll do my best to address this issue in the next patch or update. I have a bit of an issue I've been playing for about 3 hours now and my customers now come in and walk right back out almost like the shop is closed or something also my money completely reset however i still have all my items please help I don't know how to fix this. I've been seeying this issue pop up several times. I'll try to release a patch before the week ends. I really appreciate that Thoraxe375. I know on the Itch.io App, on the right hand side of my page there is a tip the creator button. Not quite sure outside of that. i don't know if you know this already but when I go to save the game and re load it I lose all my money. I can't manage to put a bladed polearm together at the table. I got a short blade and a polearm grip, but they just don't want to stick together. Tried many different angles. try to slap the blade again at the anvil and it will do it again atleast that was what happend in my smithy. hmm then I don't know it anymore :( let's hope the developer solves it. I believe he will! Okay looks like i got a couple of bugs worth mentioning. did you take the application [.exe] out of the folder? if so put it ack in, it will work. I don't get any coins in my chest, but as I it still counted my money it didn't affect the game all that much, but apparently when I restart the game, I lose all my money. Otherwise amazing game, keep it up! Hey! I love your game but the save function doesn't work whatsoever for me. when I first played the game after a bit it crashed so I thought nothing of my lost progress. but after many attempts and resets of the game I've found that saving the game doesn't save your level, progress, money, items, or position of items. on another hand, the game wont save your money or level, but will keep some purchased items in your shop(never ingots though). I'm looking forward to future updates and your success, hope this helps! hi does anyone else when tryin to sell tin one-handed sword or tin greatsword run into issue that is sells as the same price as copper one? Keep up the great work you have already done to this game. also had it but I instantly gave him and I only recieved 20 coins :'( all my money gone. Recently ran into a bug where at Day 13 customers no longer place orders. What happens is they will walk in the door, their order will pop up over their head for like half a second, then they'll just turn around and walk out. Not sure if it is just me but in the settings I can't seem to lower the gamma settings, That is what is causing me to play at around 30 fps, Other than that great game man, Keep it up. who ever does have the bug with the 13 day you can still sell stuff just use the sell table as inventory the customers will buy the stuff then but they can get stuck then. 1. when i buy a polearm grip and some other grips in the same box the polearm grip is bugging through the ground. The game is still awesome. I have much fun with it and i would like to donate but for me its a bit hard to get a paypal but there will be coming soon a donate :). Ya this is a bug, looking into the cause of it at the moment. 2. Amount of money is not enough to step up the game (in terms of affording higher quality ingots and such) - just increasing the amount a bit may solve it. 3. Customer timer - at day 13, they come in and they immediately leave. Lower the amount of seconds lost each day, or better, make it so depending on customers mood, the amount of time will be different, but enough for the player to make a weapon. 4. Customer leaving at night - the last customer should stay until weapon given or time out after night comes, without leaving. Sometimes customers will just walk in and say what they want but then walk out just after. No matter what I do in game my great swords only sell for $8! Its making me go broke so fast. On top of that every 3rd guy seems to want a great sword. It takes me about $29 to make a great sword so its really weirding me out that they are only paying me $8. Hey PhillipPurass, what version of the game are you running? I'm also having this issue, I'm running windows 7 64bit and my greatswords are selling for 7$ to 10$ when using fancy two hands. One handed swords also seems to be to cheap. It's a great game, but whenever I try to open the menu after I open shop it crashes the game. I hope you can fix the game, let me know if you need anything else. Also, I just noticed something potentially off in my log file. When I downloaded the game, I got the 64-bit version, but the log file contains "LogInit: Compiled (32-bit): Feb 5 2017 02:12:27". Not sure this is supposed to be like that or if it's even relevant, but thought I should at least say something just in case. Why is Greatsword prices and One hand sword prices so low? If I make these and put it in the inventory (Bronze sword, normal two hand) I get 7$!! but when i create the sword i pay about 37$! and so because of this, I'm slowly and slowly getting bankrupt. With the fancy two hand, i get 10$. With the one handed sword, i get 17$ which is still a loss of like 10$. Is this a bug or is it supposed to be like that because my profit keep falling, not rising. I do love the game though! My specs are windows 7 64bit. I'm running the latest version at this moment of replying. According the the update thread, this should be fixed in the newest version (Alpha 0.0.61) but it appears to be crashing on startup for quite a few people (myself included). Keeps crashing the unreal processor says "You do not have any debugging symbols required to display the callstack for this crash." Great game, but two major bugs I've encountered on the most recent version. 1.) Greatswords always lose profit. For example, my Charisma is 6, but a Bronze Greatsword with a Fancy Handle still sells at 13 dollars. 2.) At Day 13, people walk into the shop only to immediately leave, making it impossible for the player to sell anything. This carried on for multiple days, and is still an issue. I am currently unable to progress. Hi! Sometimes when a customer orders a Great product(i.e. Great Sword) I seem to only be payed 6 or 8 dollars. This happens no matter what speed I create the item at. I'm running Win32 Alpha 0.0.6, I'm running Windows 8.1 64-bit , on an AMD FX-6300 Six-Core, 8 GB RAM. Hello dear developer,i am running ver0.0.61 and it seems that if you close the shop then quickly close the door when you made a sell,the customer will just teleport pass through a wall and drop the weapon,allowing you to sell it again,and can you also fix the lighting? Hello. There's a bug where...if the walkers pushes, or you push the person that will come into your shop, he/she will just stand there and look at you. I cant proceed through the game. he/she will not do anything. just, stand there and look at me. If you reply and fix this, I would greatly appreciate that. Keep up the good work and stay awesome. Hey! I Just downloaded the game a couple days ago for Windows x64 and I absolutely love it! However, over the course of a 14-in-game-day gameplay, I ran across more than a few issues. Also another strange bug that I got was that after Day 13, Every single customer that walked in instantly walked out again without giving me any time to complete their order whatsoever. Saving and reloading didn't help. The only sale I actually got after Day 13 occurred was a sale on an odd customer who seemed to have had an error in its walking AI that froze it outside my door, which I managed to push them to the door so they could request an item and have me complete it. I'd also like an option to turn the Instruction leaflets on or off, as they get annoying once you get the hang of things. An addition of the usage of the water trough soon would be experience-enhancing as well, I find it odd that it's not used yet. Other than those things, I love the game, and look forward to your updating it. Scratch what I said, I think that was for version 0.0.60. Maybe. 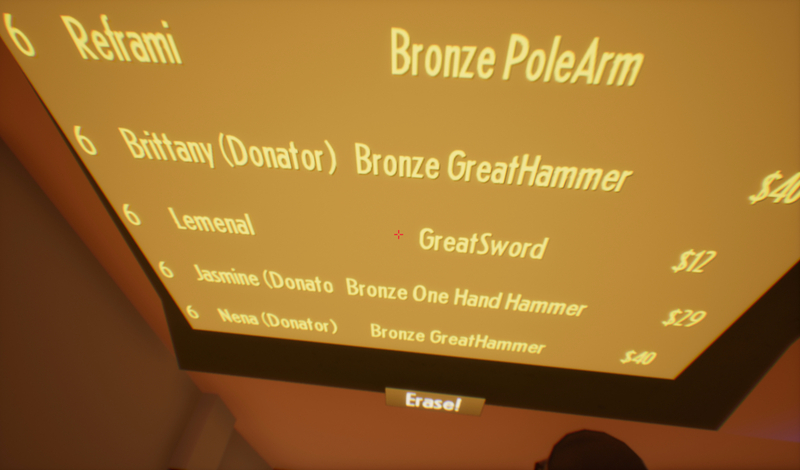 I found another bug that when you make a One handed sword and give it to the customer, there's a chance that the board where every sales are registered that the weapon will be displayed as "One handed sword", in this case it will be sold at about 11$ (with fancy handle) and other times, it will display as "Bronze one handed sword" where it will pay a descent amount of money (27$ with fancy handle) Though i bet it's less for beginners as i got like 4 points in charisma. 27$ Is still going in no profit because of the worth of the bronze, guard and fancy handle but of course the other version (11$) is just a plain loss. What is this, i keep seeing it and cant play the game, it wont even let me launch the game. It's not caused by ordering a lot of supplies, I can say that much. I ordered the max amount of copper a lot and it only started happening on day 13. Tin might be the cause but I somehow doubt it. I started ordering tin on day 11 and it only started about day 13. I wouldn't be surprised if that if that were the case. I did observe that it was getting shorter as the days passed. well i found something out. When customers come in the door under there name is always 60 and then the time like 180s or 60s but on day 13 you can see a short time 0s so i think there is nothing made for the day 13 and other days after. might be missing some timers? Cannot load a saved game. Is there a special way to do that? It automatically loads it when you launch the game, assuming you saved. you're not alone in the clipping. I've found a solution to it, however: You can rotate the weapon until it becomes unstuck. As of 0.0.61, Apparently binding a two-hand guard to a one-hand grip counts as a one-hand sword and customers will accept it. Also, Greatswords do not have an alloy registration, it seems and will pay for significantly less than they are purchased for. (EDIT: Adding a one-hand blade to a greatsword handle will apparently fix this. joe had aparently something to do and left you but Alpha 02? So far 10 days in i've seen: Greatswords selling for like 6 gold, AI characters stuck in the back of the field behind the shop, items disappearing, launching and teleporting through walls/floors. Also, if you sell an item to a character within a few seconds on the text box appearing then it undersells to all hell. If you have it on the shelves near the front of the shop and the automatically pick it up, it sells for like 10 gold even when its a 40 gold item. When I first started the game I really enjoyed it, but then I realized I wasn't making money fast at all. I even lost money some days. I looked at some YouTube videos and I was doing the same thing they were and they were making money. That's when I had another realization. On the log of deals that I made with people when I made them a tool, for every single time I made them a Greatsword they paid me only 6$ with charisma 1 and 7$ with charisma 2. That is way less than it is supposed to be. It should at least be 37 with a copper sword. (profit of 1$: 30$ for copper, 3$ for two handed grip, and 3$ for two handed guard.) After I realized that, I never made a Greatsword again and now I am actually making a profit. Over all there is a bug with the money from the Greatsword. Or this is some sort sick and twisted game mechanic. XD For a suggestion you should make the fancy grips give you more of a overall profit bonus. They do give you more money when you use them but if you calculate out the overall profit, it is the same. Thank you for listening, it is a great game and you will be a millionaire one day. After playing the game a bit more the one handed sword is now only giving me 7$ also. Maybe it is an error with the hand guard? I have noticed that my game (version 0.0.61) began to have customers come in demanding an item, but immediately leaving. I'm unsure what the cause is. Nothing I did seemed to fix this, including: sleeping, exiting & reloading the game, and even deconstructing a couple weapons I had sitting to the side. I recall seeing this happen a couple days earlier in the game, and when someone came in who wanted a weapon I already had prepared, they ran to try and grab it, they paid, then customers behaved normally. I entered day 13 and now customers seem to repeatedly come in and yell at me what they want then turn on their heel and march right out hahahah. This is a short recording I made of the issue. You can see a couple items made, resting on the shelves. To save time, this was pretty much identical to the recording I made where the two items were disassembled completely. EDIT: I did manage to sell someone something by chance, they came in screaming for a dagger but took a one-handed hammer I placed near the door. That is the only sale I have had recently hahah. Could you double check the version you are running? You can see the version number above your large window at the front of the store. I want to be sure that the issue is still there after my last patch. I feel it is definitely version .61 because it is fully updated, but I will triple check above the windowwhen I get back from work (~8 hrs from now). Thank you for the recent patch and the work you put into it! I'm no longer seeing the customer bug or problems with item sell values. Doing great so far! So, I began to encounter the impatient customer bug, where customers would leave immediately, but I'd previously discovered that customers will despawn inside the shop if you close the door behind them. I used this knowledge, and discovered an exploit, and hopefully I can describe it simply enough. My strategy was to premake all items, then open shop, give them what they want, and close up immediately. Slow, but good for impatient customers. Very prone to the watcher bug, where the customer spawns and stares at you all day, but ultimately very relaxed. So, day 13 begins, I notice two customers do 180s, and I decide to close the door behind them. I managed to do it, and the customer froze in front of the window. After offering him one of every item, he took my tin dagger and promptly walked into the wall, tossing his $122 into the chest. However, when he disappeared, he dropped the perfectly good dagger on the ground. Saving me the $100 for the tin. TL;DR, close door behind customers, fill their request, they don't take the item with them. Profit ad infinitum? Will test this exploit more. For...science. EDIT: Also pointing out, customers will accept items past their time expiring, if you can catch/trap them. Also a bug. Yes, it seems like the general bug works consistently; customers with no exit will disappear and leave behind weapons. Day 8 with titanium everything now. Sometimes one-handed weapons seem to confuse customers, but otherwise, stuff generally worked. Except for one lady who paid $10 for a titanium dagger. She's a terrible person. I mean, she didn't actually take the dagger, but still. Haha i like that. Thanx Tallbrain123 for telling me. I'll get a fix on out on the next update. It might be because the version I updated the game to is unstable. Please try the 32 bit version ( if you havent already) and see if the game runs. Realy like your game. But there are some bugs i found. Second: my Money was gone when i loadet my save. And last but not least: the Lvl-Ups seem to don't do anything. Same selling price with 0 5 Charisma as i had with 0. Unfortunately, I was unable to get a patch to fix this issue for 32 bit version. Those issues you described are fixed in the 64 bit version, but it's unstable. You can give it a try. It might be an issue on my side. I update the game to a unstalble version of the Unreal Engine 4. If you can, try the 32 bit version( if you haven't tried that already) which didnt get updated(thankfully) It still has the other bugs but hopefully, you can atleast try the game. I am finding I am unable to change settings for this game without it glitching out heavily. It defaults to Windowed but when I change anything graphically it attempts to go full screen even though I have not selected that. This prevents me from downgrading the graphics a little to run on my small Win 10 Tablet. To reproduce, close game and re-open (it defaults the settings I can see) and go into the Graphics, try and adjust settings and hit apply. Tablet I'm using is a Teclast X80 Power, which is a Win10 64bit OS using an Intel x5-Z8300 CPU (1.44ghz quad boosts to 1.88) that has integrated graphics and 2gb RAM. On a side-note, I cannot locate the config file that stores/saves the configuration, however the shopsim.log file appears to show setting changes. If I could adjust the config file (if you have it configured as such) then I may be able to bypass this issue. I'm gonna look into that and try to get it out, ready, in the next update. I see you have a lot of comments etc here so I'll keep this short. I see a fair bit of potential for this game and idea. Please consider, when you feel more comfortable of course, in putting it up for Steam Greenlight. I personally would vote for it and definitely buy it. Just a question, if I was to donate towards this game, would that theoretically (if the game/project continued) give me access to a copy of the official release down the track on whichever platform you choose to use? Ive found something interesting. You can use the great hammer part on the One hammer tool and the customer's will accept it and give you the price of the great hammer even though they asked for a normal hammer. Makes it more worth to get great hammers instead of normal ones. A really good tip if you are doing this legit is that every night, instead of instantly going to bed, stay awake as the timer wont change and nothing will happen to you if you do stay awake, the game will only resume when you sleep. In this time, what i usually do is to make every part (Hammer, dagger, swords) and order 5-10 of every grip handle and some excess ingots so that the next day, i just need to assemble the tools and give it saving so much time. I did the same for 1-2 game nights, but because I had limited funds couldn't do it too often, but oh man it was glorious. Hey I love the game! but i have two glitches to report, first was said before but sometimes the customers will walk in and walk out right away and then the others will do it too. the other is that greatswords arent even worth selling because I only get ten coins from them when it takes around 35 coins to make. other than that great game! This is a great game and i'd love to see the final result. Back to the problem. I am able to push the big statue in the backyard and idk if it's ok or not. I found a bug involving Greatsword price (atleast for Copper Greatsword). Even it does cost 3 Copper Ingots, Two-Hand Guard and Two-Hand Grip to make, it only gives me 6$ back. I have now found 4 bugs. I'm not sure if anyone posted them so i will write them anyway. 1st You need to have some swords or other weapons finished. Put them in the shelf under the bar. Save the game and close it. Restart the game and load the savegame. Try to give a finished weapon to a customer. The weapon will fall appart. 2ndSometimes a customer enters the shop and leave it immediately. If youre fast enough to read the order you can grab it fast and hand it over the bar. The customer then will come back and buy it. 3rd You can steal the weapons from a customer. Sell a Greatsword to the customer - Follow him outside - select a part from the sword (green highlighted) - Klick and hold right mouse on the highlighted part - then tilt the npc to the right (press and hold alt+ctrl) until he dissapear in the arc (you need to holt alt until the end). The sword will then fly back to you. This is how you make 5k until the 8th day. This works with all weapons. But its easier with the one which stay in the back or the belt. I think the whole saving system doesn't work properly. i had a glitch were i made a tin (costs $100 to buy one ingot) great sword with a 2 hand gard and a 2 hand grip (not a fancy one) and the person that took it only gave me $33 not $330 so i couldn't even buy 1 tin bar afterwards. This only happened when i used a normal handle not when i used a fancy one. I would like it if you, lets say, if you made a dagger not a hammer you could change the dagger back into the type of ingot it was. This would be really useful when you use up 3 ingots to make a hammer and the customer goes away before you give it to him and then you could change it back into ingots. What do the crystals do because i have found 3 of them and i don't know what to do with them. Please do more graphics options because my PC can take a LOT more graphics-wise. Seems there is an issue with the great swords. They are sold as "Great Sword" , and not as "Bronze Great Sword"
3 ingots, plus 2-hand guard and 2-hand grip and the return is $7, seems really not right. Picture of back to back bronze great swords. 1a: Get to day 13 or 12, sometimes 12 works. 1b: The customers will come in and leave immediately. 2: When I take a sword apart and then the next customer wants it, I can't seem to recombine it. 2b: Take the sword to the anvil and take it apart. 3a: Get a customer who wants a greatsword. 3b: Make the greatsword and make careful note of how much it cost you to make. 3c: Sell it, and you get around 6 gold. 4: The "Building an item sometimes phases either fully, or partially through the top part of the workbench". This only sometimes happens so it's not the easiest to know if you fixed it. Also, this isn't a major problem, just a minor annoyance. 5: Even less of a problem, you can't change your name even though there is a edit button. 5a: Press "p" to bring up the character menu. 5b: Press the "Edit" button on the top right corner by your name (which is by default 'awesomeness') and nothing happens. I sometimes only get 26 value of selling both Great and one handed swords. hey man! happy to be back to tell you proudly that your game is 10x better and playable! its around 35 38$. now, when i sell a greatsword, it costs 6 dollars, so im more loosing money then earning, which is a shame. if you could fix that the delivery is 35$\38$ worth of items and the greatsword itself costs to buy around double the cost? or whatever you like but make sence, i have no money because it all went for a damn greatsword and i get 6 Dollars in return. thanks man for all the effort and keep going im a fan of your game. I believe I am playing 0.0.6 32 bit edition on windows 10 but I can not seem to locate the version number. The first bug I encountered was when I close the game after saving, then open the game back up, I have $0 in my chest even though i had about $150 before saving and closing. 2nd was I made a tin one handed sword for a customer and I only received $20 for the sword, maybe it was supposed to be $220? But that is definitely a negative profit with the tin ingot costing $100 each and the grip and guard together being $8? This is more petty than anything but I have problems with items glitching through the walls and floor of the shop. Other than those this is a great game! I do thoroughly enjoy playing this and I cant wait for future updates! Fantastic game, but when I got to day 12 the people stopped buying. By that i mean the walked in and immediately walked back out after demanding any weapon. On Win 10, but I'm not sure what version I have, but I found this in the manifest 2017-02-10T14:21:20.905Z. Another bug i found, when I'm in the menu, my cursor is actually about an inch to the left of where it shows. Same everything else, just a different bug. Another bug, at day 15, the person who came in first immediately left (as usual) but instead of leaving, just stands outside the door. Despite the customer having left the shop, the game does not count my shop as empty so no one comes in. Basically, it's unplayable. um. My graphics card is a gtx 970. that's all i know but if you actually do need the system's specs i can google how to find them :P.
10- N/A due to... Something? Issue: It says something about not enough video memory. Steps to Issue: Launch the game. Hello, how do i detach a grip or anything by what it is atached. Sorry for language. It says it on a piece of paper, you just have to bring it to the anvil, and left click the anvil itself. Hi there! I`m glad i can help you with your game. 2. Low shadows - if you select low shadows everything flick very dark and very bright very fast. 3. Main Menu no cursor. - some times when you enter the main menu(escape) your cursor dissapear,it only appears if you press left or right click. 4. High and Epic Post-Processing - everything is very very bright,cant look at it. 5. False virus detection (Bitdefender) - ShopSim.exe is detected as virus if you use Bitdefender. 6. Bad optimisation - everything on medium make the game laggy,i can play GTA V better on medium settings. 7. When you reach the map limit grass,sky and mountains (or rocks) become blurry. 10. You caracters body parts (especially feet) will glitch inside small rocks and trees. 13. "Place Order" text is in the air. 14. I can move that really big stone guy who is in the back.I can make it jump too,and glich him inside trees. 15. You can block other characters and they go crazy. 16. If you throw a crystal high,youre not gonna have it again. 17. Crystals can be glithed inside trees and rocks. 18. Downloaded the game for 64-bit but it runs in 32-bit. I apologize for my bad english,im a romanian guy. Hope that game become big. Por favor me ajudar quando eu abro meu jogo ele crash e aparece um erro de UE4-ShopSim, por favor como corigir? Translation: please help me: my game crashes and gives an UE4-ShopSim error when I try to start it, can you help me fixing it? It's great! I love the game, the only bug that I have encountered is when I make a greatsword, it gets stuck in the table and kind of makes me go out of business... Sometimes it will glitch back out the next day but almost every time I make one this happens. I have the newest update. Great work on the game, very creative! *some of the costumers come for only 30 seconds while some other come for 130 seconds approx. 1. I am using the latest version of the 64 bit, 0.0.61. 2. The issue is that the great sword cost me 36 gold to make, but they only give me 6 gold back, I loose 30 gold from the sells... isn't it suppose to be the otherway around? I make more gold from great swords compared to what I payed to make it? 4. Just make a great sword in the 64 bit, 0.0.61 and sell it to someone asking for it without any charisma points, you gonna get only 6 gold instead of something like 39 gold or something of the kind that makes you profits. 5. I don't think its needed, its not a graphical bug, or my game lagging or anything that has to do with the spec, its gameplay wise, probably in the coding. Great game dude really love it but after a certain amount of days though the A.I walks in then walk out instantly without a time to make anything, it starts usually on day 13, if you have any idea on how to fix this plz tell me, thx. After around day 8 the NPC's start entering and leaving right when they enter. Also the time for NPC's to leave gets progressively lower and lower to the point where I can no longer make anything but a dagger in time. Hey SolenFilms, try the new update. That issue should be gone. Let me know if it's still there. When ingots snap to anvil it often doesn't recognize how many are attached and will produce a small blade, and leave one ingot attached. Prepare 3 ingots, snap all 3 ingots to the anvil, hit with hammer. Most likely unrelated, but i7-6700HQ 24GB of ram. Did you do anything else other then put the ingots on the anvil? How many times have you used the anvil before the issue started? The first thing that was requested was a Great Sword, so the first thing I did was put all three on and try to make the great sword. The only thing I've noticed after playing around with it a bit more is it sometimes snaps and then unsnaps kind of. It'll stay in that one spot, but the anvil won't recognize it. It happened early when making a dagger. If I right click the ingot it moves a little bit. In my honest opinion, the old method was good. Maybe just increase the size of the anvil or something. mhm np, oh also i used to be able to run the 32 bit version but not 64 bit now its the opposite anyway i can run both or no?? Not quite sure why you cant run the 32 bit. Are you updating the old files or installing a fresh version? 1. Anvil is pretty broken now, I cant get past a day as when people needs a one hand sword, and so I put 2 ingots on the anvil, it doesn't recognize that there is 2 and so it makes a dagger instead. This also happens to Great swords/Hammer so sometimes it'll create a dagger and sometimes it'll create a one hand sword instead of a great sword. Only a fraction of the time does it actually make the item I'm asking for. And also if its 2 ingots on the anvil and the other gets made into a dagger, the dagger itself can get stuck inside an ingot. 2. Another bug I noticed is that sometimes the ingots wont snap on the anvil and so you will have to keep fiddling to get it to snap. This also happens if you try to un snap it from the anvil as sometimes it doesn't pull the ingot away. I miss the old way of doing it, even though it was at times a hassle to get them on the anvil, it was more immersive and fun. Though I know you will make the right decision as I still love the game and its concept. 3. I also noticed that if you start a new game, gamma goes to 0 and so does resolution, atleast for me. Made the hole game black until I realized the issue. 4. I tried to assemble a one handed sword on the workbench that had some stuff on it (not sure if its that what caused it or not), I had the handle and guard ready and I had just aligned the sword with the rest and then what happens is that instead of creating the one hand sword, it creates a dagger and the notification goes crazy (I got like 6 messages telling me I had made a dagger). I'm thinking of adding an option in the options menu to enable or disable anvil snapping. Whenever I got a order of a great sword or great hammer or a one handed sword, I just snapped the ingots on the anvil and hammered it and then I didn't get what I was trying to make. Oh and btw, if you hammer an ingot on the anvil for half the duration it would normaly take to craft a dagger but then put another ingot or two and continue hammer it, you would expect to get a greatsword but instead it creates a dagger and leaves the rest of the ingots alone instead of using all of them. Also if you one ingot on the anvil, you can change its position and then if you try to hammer the anvil, nothing will happen, no sound will occur and no crafting will either which means you need to reattach the ingots on the anvil. I used the anvil when I first start the game after the ingots are smelted. I saw Blitzkriegsler play this game and thought I would enjoy it. I tried downloading the 64 version, and after a few seconds it told me there was a network error. I resumed it a few times after it paused. After a couple of resumes, it told me the file was forbidden. I don't know how to fix this, but if you can help, I would appreciate it. Are you downloading it from the app or from the website? I am using the most recent, being 0.0.62 but I can't make greatweapons. When I put 3 ingots on the anvil after I hammer it, it turns into a sword piece. Hi, I'm here to post a bug. In version 0.0.62 (I think that's the name, there might be one more zero) there is a chance that your customer will get stuck, forcing you to reset the day. This happens when two NPCs walk across the path of the customer while they are on it. If they squish the customer between them, they will be forced to move to the side, but will keep walking. However, I had a customer get stuck behind a pillar, and now I have to reset the day. This is simply because of the angle at which the customer approaches, aswell as the placement of the pillar. Here is a picture: https://docs.google.com/drawings/d/1ihgG7VHMGaDH00X12o4Z9OUcbo1166_GKwgjyoR3GHs . Unfortunately, there is no way to easily reproduce this bug, as it was pure chance. This was in the Windows 64bit version. Its happened to me a lot, where the customers would come from a certain direction then get stuck on a prop or entity and just stand there, Other times, NPC's will walk into the customers and then they wont be able to get to you, but most of the time, the customers start jumping out of the way and then they get to the shop. Its such a hassle that the waiting timer doesn't start until they get inside the shop and so ive had to randomly choose a weapon and keep going back n forth to give it to them. Reproducing is kinda hard because it sometimes works, sometimes not. Only happened this time, didn't happen again after that yet. 3. When ordering items: they explode when opening crate if it contains one polearm or too many items. 4. Black bar on 2nd screen when in fullscreen. 5. Saves not working properly. Day count, the shop names font size and color aren't saved. That's all for now, keep up the great work! For 1 and 2. I had trouble reproducing that bug on my end so couldnt get it fixed. This helps me narrow down the issue better. I'll aim to fix it for the next path. I just found a huge bug that made me reinstall the game.This bug happend in the version 0.0.62.When I wanted to put a name at the shop,I couldn't press the done button.And then I pressed ESC to save the game and then rejoin.When I rejoined the game,everything was black and pixelated, I could se only the cooper ingots.So I rejoined and rejoined , but the same thing happens.So I reinstalled the game. Try looking into into your graphics settings and hit the reset button. Let me know if that fixes the everything being black and pixelated issue. It worked!Thanks a lot ! I like how the ingots lock onto the anvil (sometimes), but when ever i try to take a ingot off and it keeps getting locked on and eventually get it off, that ingot doesnt combine with other ingots once i put it back on the anvil, and it has caused me to make many not needed blades. Hi I'd like to start by saying i love your game, but i keep getting an issue where sometimes when i put 2 ingots on the anvil it only recognizes one and makes a dagger instead of a one handed blade. im running the newest version as 2/14/2017.it seems to only happen if i put an ingot on before a customer walks in and then the second after. not really game breaking if thats the cause because that can just be avoided , but its something that is a bit buggy. 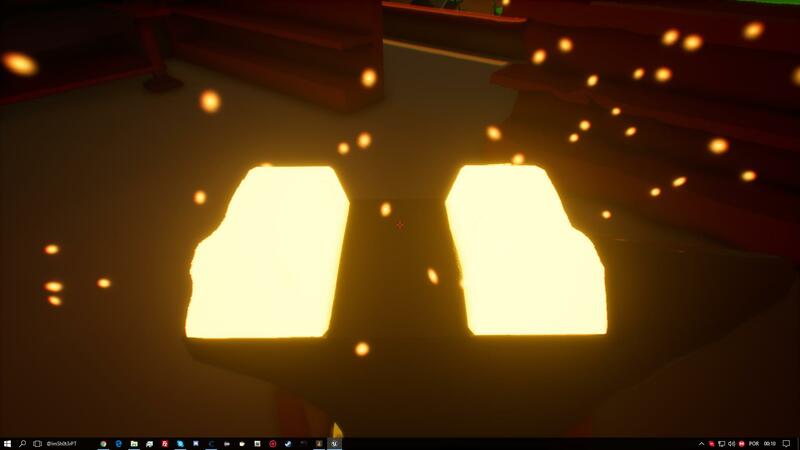 When in and near forge and crafting area I get lighting gliches where the light would flicker from being bright to dim it doesnt affect game play but just for the epileptics out there ;) , sorry its vauge only explanition I could give - Did some more testing i find when post processing isnt on epic the bug happens(so far). Couple of bugs for you man to look into so i can stream this game. 1. When you mess with graphics options i.e. set to full screen instead of windowed sometimes Gamma will set itself to 0. 3. If you move ingots whilst they're on the anvil, they refuse to work after i.e. they cannot be hammered in to anything. i took the picture right after it happend. I still realy like your game and it's probably hard for you to see so many bugs and you have probably much work to do so i aprecheate it. I'm excited for the next updats. somtimes when i heat up a copper ingot the game dont let me punch it with hammer on the anvil. i place it on the anvil and punches but this isnt turn into a blade and didnt play the saund of hammering. I don't know if this is a bug or something in the game but I sold a Great Sword and I only recived 5coins so I losed about 29 coins! please do something so you can't lose money like that. i really love you game! it is so awesome, and the way to make weapons is cool. How big is the team that is working on the game? or are you working alone? I myself am a beginner in 3d modeling, at it would be cool if i could help you in any kind of way. That would really be so cool, i understand if it is now possible or something, or if you rather work with your team/alone. TIP from me to you: When the day is over, instead of instantly going to sleep, create tool parts for every weapon (Hammer heads, daggers and swords), and create some finished weapons to have on the shelf. So whenever a customer comes in, give them an already finished weapon, then create a new one from your parts. When someone else comes in, you've already made another weapon. Give, create anew repeat. This will allow you to continue to even 10 seconds or less if that would be the case. hi I was playing the game for a bit and i got to day 4 then i saved an exited the game when I reloaded I was back on day 1 and all my progress had gone. so I deleted the game and downloaded it to again make sure it had downloaded correctly after I unzipped it I started the game and found all the starting item had gone other than the unknown crystals. Sorry I don't have an image and I can't test for repeatability because I don't have anything but the only thing that I did different to other players was that I downloaded and played it off a memory stick however I didn't turn off my pc or unplug the memory stick between playing it the first and second time. Also I had another bug while playing I had a copper ingot that I heated up so it was ready then I moved it over to the anvil I then tried to hit it with the hammer and it wouldn't let me hit it I tried moving it to the other snap spots and taking it off and putting it back on but nothing worked I also tried putting another ingot on the anvil but it was just ignoring the glitched ingot and making daggers. Hope this helps looking forward to playing the game while it develops. ill check for reply's if you have any questions. When naming my shop after i had named it once. The GUI for naming the shop actually stayed on my screen. This froze my mouse and it wouldnt let me click done. I could get mouse control back by hitting ESC. But the GUI stayed on the screen. Same strange ingot glitch being reported. I'll try and give any details I've encountered. Snapping ingots in order (closest to furnace, middle, farthest; 1, 2, 3 from here on) seems to work consistently, though it's difficult to get them to snap in that fashion. If you snap them on opposite sides, leave them; moving either to 2 will likely turn that one into what I'll call a "ghost ingot". Ghost ingots can be hammered (silently), though they display very peculiar properties. I haven't noticed enough consistency to say for sure what's happening behind the scenes, though. The silent ingots do seem to add to the hidden counter; hammering a ghost ingot 7 times may not turn it into a dagger, and stacking three other ingots may make a greatsword on the first hit. It's very peculiar. Moving ingots between the three slots seems to be the root cause of the issue. If I drop one on 1 and 3 and hammer them once, it plays the 2-ingot sound, and if I swap them, they both become ghost ingots. No sound when hammering. If I place another two ingots on slots 1 and 2, it plays the 2-ingot sound once again, and the 2 ghosts are restored to their usual sounds. I've noticed it's possible to have both ingots on the anvil treated as a pair of single ingots, and in general, removing a problem ingot for a forge or two should fix the problem. Rule of thumb: don't move the ingots. Oh, and the telekinetic hammer bug, where hammering a heated ingot while another is on the forge will act like you hammered the one(s) on the forge. No matter the distance. I love this game to death. Even with the current state it is in, with the few bugs there are, I find it still enjoyable and relaxing to play. I can't wait for more updates to come out and want see this game fully furnished. I terribly wish to gush about what I love about the game, but I'll wait until the end, that way the problems are presented first. The first bug I would like to mention is the greatsword glitch. I have seen another person mentioning this, but I thought I'd share all the problems I have, regardless if anybody else has it, to show that multiple people have these bugs. Whenever I sell a greatsword, it always sells for 26 gold, much less than the original price. Just once I got it to work, but in the process created another bug. Next is the trait tree glitch. In my save, the traits and skills you can increase don't work. I've tried putting points in charisma and strength, but I see no change in the outcome. I don't know if they have been fully implemented, but for me these don't work. I've also had a problem with money. Whenever I save and exit the game, I loose all the money I had when I left the game and start with no coins. To counter-act this I spend all my money on items so I have no money to loose. For now I can deal with it, but it would be nice to be fixed. Lastly, the experience glitch. Somehow my experience bar became 0/0, and every weapon I produced leveled me up. After shutting down and re-opening the game, it fixed, but I figure I would mention it just to tell you that it can happen. I've also come across people bugs. For example, one person got stuck in my backyard and created havoc. The only way to make him get out was by restarting the game. Also for some reason the giant in the backyard actually started walking around and got stuck in the tree. I believe that isn't supposed to happen. People also would get stuck on my doors. Another thing I found is that when I get around Day 13, people would instantly leave the shop. I had to start a completely new game after trying a variety of methods to fix this. Those are all my bugs, otherwise it plays just fine. I believe they are all program based, because they have nothing to do with my computer specs. I love this game though, it's very relaxing to play and I enjoy making a variety of weapons. I think the customizing part is genius. It makes it so you can create different weapons instead of making the same weapon over and over again. I also enjoy the atmosphere. 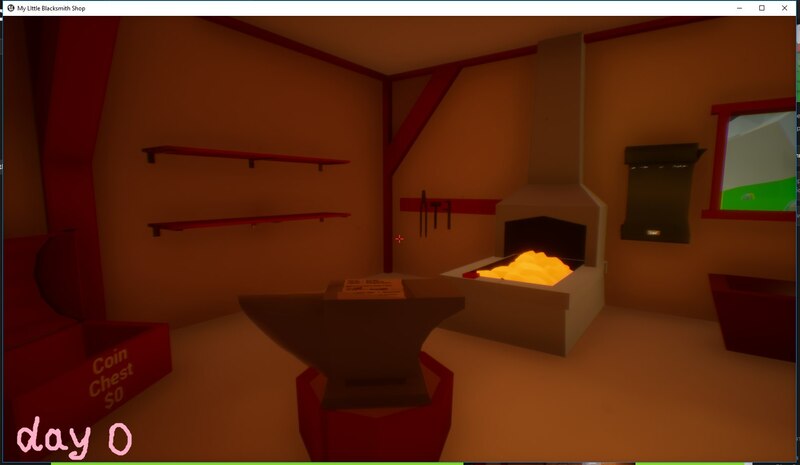 It just seems so cozy, working by an ember lit fire, hammering weapons to sell. It feels like I'm actually running my own shop, which I love. Keep up the great work! I'm heading off to put in my ideas for improvement. I'd put them here but I feel it'd make my message too long! Update: This is all for the last version. I wasn't on my computer for the last couple of days so I missed the latest update. The one day I don't check for an update XD. The only problem now is that every time I try to open it, it says the unreal engine has crashed. I've restarted my computer, downloaded it multiple times, but I can't get it to work. Guess I can't play it for the time being, because I copied over the old version of the game. If I can't get this to load I'm stuck not being able to play it. I don't know how to fix the engine from crashing. There is a strange glitch where occasionally better ingots (Iron and occasionally tin so far) won't change to weapon ends. i keep hammering and nope. I just got the game today: 2/14/2017. The version is alpha 02. i dont really know how to reproduce it. it seems pretty random. Hi! I'd like to report a bug. This bug is simply a game crash that occurs when you put your PC into sleep mode. I had another tab on main while I turned my PC into sleep mode, and when I turned it back on I had a crash message from the unreal engine. I'm running Windows 64bit version 0.0.62 . But here is what i have found of bugs in v0.0.62! I heat up some copper ore in the furnase till they are ready. If I want to make a hammer head I place 2 ingots beside eatch other on the anvil and start hitting them with the hammer, but 8 out 10 times I end up with a small blade for a dagger. The second ingot do not get used and it's still connected to the anvil, so I can't even get past day 2 because I have used all my money on ingots. I hope this will soon be fixed, because it breaks the game for me!!! The second bug is that when it start the game it's very dark and i can see nothing, but I have found a tempoary fix for that. Just go to Graphics options and hit reset that fixes the issue. The third bug i found was when i load up my save game my money is gone. I boot up the game, its 4k, I have a 1080p screen, I can't change it back, it crashed whin I click. So I played a good while until like day 6. Then I attempted to Name my shop but it would not let me out of the text screen for naming a shop. So I tried exiting out of it and back in and it opened up but I had no money and no materials to make anything. Not sure if before leaving a game all the time to click save game or not. I downloaded the 64 bit version so not sure if that matters. If you need more info let me know. P.s. This type of game has been a type of game I have wanted to play for a long time. You have done a very nice job in setting it up. I hope this goes a far way in development. Absolutely love this game, although it is pretty buggy I still enjoy it. But I have a recurring problem.. after about a day or two, in game, the game slows right down and then freezes, and surely enough every single time this happens I have to start a new game because my save wont work. would really appreciate some info on this please??? I launch the game and I never know, which bug I gonna catch this time. The most annoying one and the only one I can't solve by myself is when I exit the game and start again: all progress resets, there is a text "day 0" in the corner, and I have no items or money, so I have to start new game. Also, in 13th day customers enter the shop, order and leave at once without waiting for the order. Sometimes they could take an item on the shelf, but very rarely. I hope, it will be fixed soon, because I still absolutely love this game. I'm on Windows 10. I can't craft something with "great" in the name. I need 3 ingots, i place it on the anvil and then i craft a dagger. That's with 2 ingots too. I'm only craft dagger. Hello Dasius, when I start the game, this happens: http://prntscr.com/e92czs. I waited 5 mins and nothing happened. Tell me if you know the bug. Thank you. I've ran into the same issue as a few others above. I sleep the night, get to day two and find myself unable to make anything above 1 ingot. Even when 3 are on the anvil it keeps making short blades. If it helps, the hammer sound stops too so you don't even know if it's working and you're just swinging silently. I'm having the same problem I think it might be caused by the snapping to anvil mechanic that got introduced as i had 2 ingots on the anvil snapped at opposite ends which only allowed me to make a dagger blade. and the other ingot became unusable. Having said that you can still make short swords with a dagger blade but you get a funky message that says you created a dagger and one hand sword at the same time. My suggested fix: Remove the snapping to anvil. When i put 2 (ready)ingots on te anvil, one of the 2 isn't registered. When i try to hit it, it makes a one ingot blade instead of a 2 ingot blade. One of the 2 ingots stays on the anvil, but when i try to hit is there is no sound and nothing happens. If i then pick up the remaining ingot and place it back, it still doesn't work. So this means the ingot is rendered useless, and I am only able to make one ingot builds.Any quickfixes? This game is already fun, and shows a lot of potential, keep it up! best fix is to revert back to the older version and wait for the next patch or simply make one ingot items. you can still make one handed swords with dagger blades. I suspended my pc and thesave game gone. By closing and opening the game, the game continue to load the saved game, but if you suspend pc the progress is over. I cant prove this is 100% correct because it only happened once. If I find something else I say. I'm not sure if this is known already or not, but there is a lighting or graphical issue. I got the bug where one of the anvils won't make anything, so I decided to start from scratch. Everything went pitch black dark, minus the light around the torches. Edit2: Figured out the issue, gamma was turned down to 0 for some reason. 4. Its by random chance but just make the great sword and try to give it to the customer, theres a small chance this happens. hey dasius great work on the new update I love the new scenery but that's not why I'm here, I was playing it to see what changed and I noticed that when I went to right something on the sign out front it wouldn't let me out of it, the menu for the sign was still there even when I walked away and when I tried to reset everything stayed super pixelated and dark not sure if its a bug or just me. Everyone seems to be having the same problem with the ingots on the anvil not being used (place 3 on, make a blade with only 2). I noticed this on occasion too, but it only seemed to happen when I removed/repositioned ingots that had already snapped to the anvil. After removal, those ingots were "broken" and unusable. To everyone having this problem: once an ingot snaps to the anvil: leave it alone and you should be okay. when i click the launch button on itch.io app it say to install Microsoft Visual C++ 2015 Runtime but i ahve already installed it.My pc specs are:Operating System Windows 8.1 pro 64bit;Processor AMD Phenom(tm) II x4 955 Processor (4 CPUs),~3.2GHz;Memory 8192MB RAM. Please see this: CLICK HERE! I did that but nothing changed.The error its still there. There might be some files you dont have that are required to run the game. Make sure that you're MV C++ 2015 is updated. or you can try manually download and install from Microsoft. Also try uninstalling and reinstalling if it still doesn't work. Thank you very much for fixing the "day 0" bug in 0.0.63, this is REALLY helpful! But now there is another two bugs: ingots keep stucking in the floor texture, and the sky and the light are messed up. It looks like the day and the night are changing too fast, a hundred times for the actual day. It's light for a few seconds, but then the darkness came for a few seconds and so one. But this is way better, than resetting all progress, so thank you for 0.0.63! I noticed that the lightning was brighter this time then it was before but then I noticed some bugs. 1. The moment I got out of the bedroom, all the grass textures only rendered like two-three feet away from me, and so if I went backwards, it would derender and if I went forwards it would render again. I did not notice that Pre-patch. 2. The lighting in the shop and the sky outside keep changing and so at day time, it feels like at multiple points that time is going way to fast as I've seen sundowns (orange sky etc) at day time and other times, the outside gets really dark for a short period of time. Even at night it feels like a new day has just started then it's back to normal. The lighting inside the shop keep changing aswell. 3. A really annoying bug that I've found is that when you order a shipment with lets say 5 or 10, the ingots will glitch into the floor when you unpack it while Pre-patch the ingots would just fly upwards. 4. If you put materials on the workbench to craft with, there's a chance that if it glitches through the workbench and if there's other parts on the workbench, the sword/hammer/dagger will leave the grip and guard it was made for and go to another material like a pole or one/two hand guard and so I've had to go back n forth to dissemble for example a greatsword that kept going for one handed guards. Also made a mess which wasn't fun to clean up. 5. A bug which is EASY to recreate is to take 2 pre-made swords or poles and then put them on top of eachother, doing so will trigger the notification to tell you that you've crafted that item, and so this is basically spammable. This also happens on the workbench. 6. The anvil still has some issues, as if I still add 3 ingots, theres a chance banging it will make no sound or any crafting whatsoever and so I've had to take an ingot out and replace it to make it work. 7. The anvil also somehow (idk how yet) has been able to disassemble a sword I put in the shelf infront of it probably due to me disassembling the great sword I talked about earlier. Any news if the alternative option to make it so that you can use the old anvil to be added? I for one miss it dearly. Oh and 8. Greatswords only produce One dollar now as profit, its better than before but it's not really a lot (I used a fancy two handle). Hey Dasius, Loving the game and it has great potential but there's a bug that's interrupting my play enjoyment (I've lost a few hundred coins worth of ingots). I'm running windows 10 version 64 bit alpha_02 (I think, I'm afraid I Cant find the patch version,,,, ). When I bring in a create of ingots (more than one) and open the crate in the shop, i have ingots jump out, normally i loose at least 2-3 ingots under the floor and the rest are around the shop but occasionally ill open a crate of 5 and they fly out (glitching off and thru the floor) and vanish leaving me with maybe 1.
left the game before I could get a snap shot but im sure that if you bring a crate of 5-10 ingots (copper at least not sure about the others, lost too much money to advance to tin) into the shop and place it on either side of the forge and open it you'll get the glitch. Perhaps if you program an ingot array to stack them as they spawn rather than what apears to be a single locatation spawn causing a ridged body push apart,,, just a thought! Time of day is not saved, so if you "feel tired" and save and quit, when you restart it, it will be as if you're waking up at the start of day 1 again, but with all of your money and levels. It also does not save weapon parts which are "bound" together already, eg. every weapon stocked on your shelves will fall apart when loaded. I am also seeing the main pause menu not un-hide the mouse until you click, meaning you might accidentally click a button before you can even see what you're clicking... Maybe that's just in fullscreen mode, though? For some Reason it's linked to Steam VR?? I restarted my computer, made sure steam was closed and then started the game and it still launched Steam VR and if I exit Steam VR it exits the game, the game still displays on the screen but not in the Vive headset (not that I was expecting to, didn't figure it was a VR game) but that's a bit odd of a bug there..
1) Ingots fall through the floor when i open a Delivery inside the shop, i am unable to pull them out of the floor. To get the ingots out of the floor you can rotate them, It's not that effective but you might get lucky as if you get half of it above ground, it's pretty easy from there. The rotate controls are a little inverted, its not that easy to use tho. Hey, Dasius. I have a pretty bad bug that could probably be fixed quite easily. I had just assembled a Tin Greatsword on my crafting table and the blade just snapped through the crafting table, and I am unable to move it, making me lose 330 dollars. It could be fixed by allowing disassembly of an item anywhere with three hammer blows, or so. I have no idea how to get a screenshot on Unreal and using "prt sc sys rq" isn't working with imgur. My specs are as follows: ASUS Strix GTX 1060 6GB, Intel i7 4790S, 12 GB of Kingston RAM. Its a common bug known for a long time, its not completely fixed, but its being worked on. He haven't fixed it yet but it's slowly getting improved and better. If you want it to get unstuck, you can rotate the sword out of it being stuck. It's a little wonky to rotate but it works. You could also tap right click to edge it towards you, this usually only works if you rotate it first to get half of it above ground then tap right click. Thank you very much. Just did it and it got it unstuck. My whole screen turns black when I look at a light source. I'm running the latest update, I simply loaded up the game for the first time. Everything was fine, saved my game, quit the game, 2 hours later loaded the game up again and everything is black. My specs: 8 gigs of RAM. GeForce GTX 960 2GB. Windows 10 64-bit. I think it happens around day 12 but I woke up, went into my shop, the noise for a new customer would sound, I'd turn around and they would just walk away strait after the walked in, so I've restarted my game and I haven't noticed it happening again(I haven't got back to day 12 yet) so it might have been a fluke, but t I was just wondering if that has happened to anyone else? Also I think the pay for great swords should be higher as I spent $308 on making a tin one and I only got paid $9? And just as a question, do the times you get to make weapons shorten deliberately or no? Also I'm sorry if I have posted in the wrong place for my issues. (edit) don't mean to be annoying but I'm posting this at nighttime so I can't check my computer, I will in the morning, but I don't know what spec my computer is, I know it has 2 terabytes of space, I do not have any photographic evidence and I do not know what version of the game I am running. And again sorry for seeming or being at all unhelpful but if you would like to know anything, ask away. I would buy some stuff but when i open the box everything glitches through the floor. it causes me to spend a lot more money than i have to. Also, in the options tab I can't turn off the sounds. Is that a glitch in my game? Alpha 0.0.63 the patron gets and never makes an order sleeping in your bed dose not fix it you cant even sleep in your bed to try and fix it you kinda push the patron around don't know if you can push the patron into the shop. I'm looking into the issue and should have a fix for the next update. 2: After I saved the game and closed it, reopened it everything looks VERY pixelated and very dark. So I uninstalled the game, this did not help, then I accidentally changed my resolution, so much so that i cant change it back. So I reinstall the game, again this did not help. Please tell me where the settings are located :(. Ill refer you to this link, hopefully it will help you. The save game file locations is referenced in there. I play for around 10 minutes and the game turn off my pc instantly , is it me or is something that other players experiens? So I've ran into this glitch five different times and my only option is to restart the game and it's starting to frustrate me. Whenever I open the pause menu I have no mouse cursor and I have no idea how to fix it, please help me. Try right clicking or left clicking. If that doesnt work, ill look into the cause and get it fixed for the next update. Thank you so much! I didn't realize that all I had to do was a simple right click! I'll still look into fixing it as I believe a lot of people are having the same issue. For anyone frustrated about losing things in the floor, I've found a couple of techniques to help with this. 2: I'd open the crate outside where it's delivered and carry things in one at a time. If you do have things stuck in the floor, spam right click on it until it pops back out. I've had this work for me 100% of the time. Thanx for posting this solution, i'll put in in the common issues the help other players until I get it fixed. Thanx for letting me know, i'll look into the issue and get a fix. Thank you for reporting the issue. It is a common problem i'm looking into. You can rotate objects when holding with Alt(Ctrl. You can rotate them out of the table. I like that greatswords are fixed now but their prices are still to low. I got like 42 for a bronze greatsword with a fancy two handle. 30$ ingots, 6$ handle, 5$ guard = 41$ cost. ONLY 1$ profit. Happens every time I craft it. Please reply if its relevant to what the person posted, please. Thanx. To reply to your issue, the One Hand Guard is $2 and the Two Hand Guard is $3. Unless the game is bugging out with the prices, but on my end, those prices are the same and I don't see how they would change without me changing them. Can you double check and make sure that the prices are $2 and $3 respectively? Hopefully next update, I can implement a method for player to see details of every transaction . This can help finding errors in a transaction. Other than this forum is about bug reports, my reply doesn't have anything to do with his reply. I did it purely because it would be easier to get a reply if you reply to the creator yourself. About the issue, I was a bit wrong. You are right, two handle guards are 3$ not 5. I've just checked about it. The profit wasn't one dollar but two dollars. its still low though. Oh and i just noticed that you don't get any profit on daggers. Copper dagger = 10$ copper, 5$ fancy handle = 15$ make, 15$ sell meaning no profit. You mostly gain 5-6$ with fancy handles on every weapon other than daggers, greatswords AND one hand swords. Also, you don't have to use the normal hammer heads, as customers accept great hammers as one handed/two handed and polearms. Lol, that is true, you did get my attention. Sorry about that. Managing development of the game and attention to peoples concern is difficult with so many issues that need to be addressed. Not trying to ignore anyone. Ya the mark up is pretty low. I am tweeking the numbers to get it just right. I have to consider how much Charisma will affect the end price as the player levels it up. In the end, if I increase the mark up then I have to increase the prices for everything else so they are still challenging to obtain while taking into account charisma. Balancing act. The copper dagger is probably bugged and ill look into the possibilities to why there is no profit. Ya you can totally use a greathammer head with the one hand grip and sell it as a one hand hammer. In the end, it is a one hand hammer just with a really big hammer head.. So you'll get more for what you would normally sell a regular hammer head. The idea is you can make any weapon and sell it based on what the customer requested even if its non conventional. Still working on it though. Its definitely not where I want it. Yeah, normal hammer heads is basically a waste of time now as its much faster producing great hammers. Btw when checking the prices up, I saw that all weapons I had premade last time I played was disassembled and so I had to reassemble them. You are looking into the case that ingots get trapped underground if you order a too large crate? And that lighting changes the time of day when in reality the time didn't change? (At one point its dawn and on another point its night time then day time). About notifications: They seem to spam the messages a lot when you either craft them or bump two of the same on each other. And lastly, I love the new crate for the polearms but what I've noticed is that when you unbox one with a lot of polearms, they still glitch and bounce around. Would be really cool if they spawned in a sort of stacked laying position like you would put logs in on the floor. I cant play it wont let me i am on x32 but it wont work please help me.